TIMOTHY P. BERRIER, Esq. - Nathan, Dumm & Mayer P.C. Tim received his legal education from the University of Denver, Sturm College of Law, graduating in May 2016. 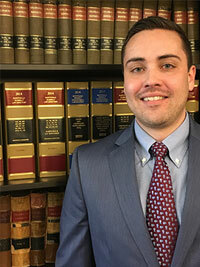 While in law school, he served as a senior staff editor for the University of Denver Water Law Review and was fortunate enough to participate in DU’s Street Law Program, where he had the opportunity to teach basic legal concepts and life skills to juvenile offenders transitioning back into society. Throughout his second year of law school, Tim had the honor of serving as an appellate law clerk for the defense team in Chevron v. Donziger, a Second Circuit RICO case stemming from a long-running environmental suit that resulted in one of the largest judgments in the history of international litigation. Tim joined Nathan Dumm & Mayer P.C. as a law clerk in February of 2015 and was hired as an Associate upon admission to the Colorado Bar in October of the following year. Tim’s practice focuses on representing governmental entities in a wide range of litigation matters, including civil rights lawsuits and employment related claims. Tim also assists with the firm’s insurance defense, construction defect, and premises liability practices. Tim received his bachelor’s degree in Political Science from the University of Colorado at Boulder where he remains active in the CU young alumni community. As a proud Colorado native, Tim spends his free time exploring everything the state has to offer, and on weekends he can be found cheering on the Buffs and Broncos.